This photo is a tough one, and I’m guessing 99% of you have no idea what I’m trying to show you. You aren’t alone. When our guide used his laser pointer no one in the boat saw what he saw. This drove our guide insane, so eventually we all said we did. Later that night, during dinner, all six of us confessed that we hadn’t seen the Boa constrictor. Yes, behind all of the leaves is a Boa. When I got home I downloaded all of the photos and guess what, I finally saw it. Sort of. Our guide wasn’t playing with us. Now this makes me wonder, how many critters were out there that we couldn’t see. And how in the world did our guide spot this? If you look just above the green dot you can see the snake. This entry was posted in Uncategorized and tagged Asia, Boa Constrictor, Borneo, Kinabatangan River, Life, Malaysia, Nature, Photography, Photos, Sabah, Snakes, South East Asia, Travel, Travel Blog, Travel Journal, Travel Photos, Wildlife, Wildlife Photography. Bookmark the permalink. It’s hard to see him, even though he isn’t that tiny. Interesting balance…does one tip the scale more? Wow! I cannot imagine how many critters go unnoticed. I’d rather unnoticed than right infront of me haha. If they aren’t bothering me I’m ok with that! That is my theory as well when I go on these trips. So far, it’s worked for me. I actually saw the snake before I saw the green dot. I was like what green dot is he on about? I guess not being a big fan of snakes helps me identify them faster. I wasn’t sure if it was an owl or something at first but I definitely knew it was a creature. We did see some owls, but never got a photo of one. Yah. Boa my arse. It’s somebody’s worn-out leopard print undies that have blown off a washing line somewhere. LOL…why didn’t I have that line at the time? Yes that would get me! I’m assuming you eat the cake with your fingers. I think I must have an eye for snakes, as I spotted it first time. 😀 Good job you were in a boat and not trudging through the undergrowth. Well the boat at one point was underneath it and I wasn’t too thrilled about it. But I think finding this one during a hike would be more terrifying. Yikes. I don’t like snakes at all and would be totally freaked out. You and the better half. I’m not a fan of them, but I find them interesting. Just as long as they aren’t too close. Wow! It’s amazing how those creatures can hide. It was a good idea to take a picture even though you didn’t see anything special, well done! I remember hiking in Danum and I smelt a weird smell, the guide told me there’s a leopard near by (we were walking in it’s territory) but we never saw it. It was probably sitting in a tree watching us walk underneath it! a leopard! That would freak me out. There was this couple in Zambia that went on a walking safari and they came across a rhino. They guy said his heart almost burst out of his chest, but he couldn’t move until the rhino walked by. I would have died. Just fallen dead. I would want to tell everyone that people would stop inviting me over to dinner. It is so interesting (and scary) to think that there is so much stuff in this world we don’t notice! Thanks for sharing the photo! I think if I knew about all the things out there I would never, ever sleep. Ok, I see its eye…or maybe that’s just one of its spots! It’s actually scary thinking about how many creatures actually go unnoticed! Yes. And don’t get me started on the invisible stuff. I love the show, Monster inside me, but it freaks me out. I’m happy enough around a constrictor – anything poisonous would probably have me running for the hills! I was afraid of our two for a while – kept having nightmares that they had got out and got in the bed with us! But until we got the pups our snakes were the most cuddly affectionate pets we had! They would sit like a labrador on your arm and watch Top Gear with us! Do you have photos of them watching the telly? I think it’s probably a good thing that you didn’t see half of the creatures that were out there. You may have had trouble sleeping at night :). Especially since I kept finding unwanted creatures in my room and in my bed. Yikes! Ewwww! What kind of creatures? My extremely scientific answer is bugs. Mine was to keep swatting at things that were or weren’t there. I hate that feeling of something crawling on me. Very interesting. I saw the snake right away before reading the text of the post. 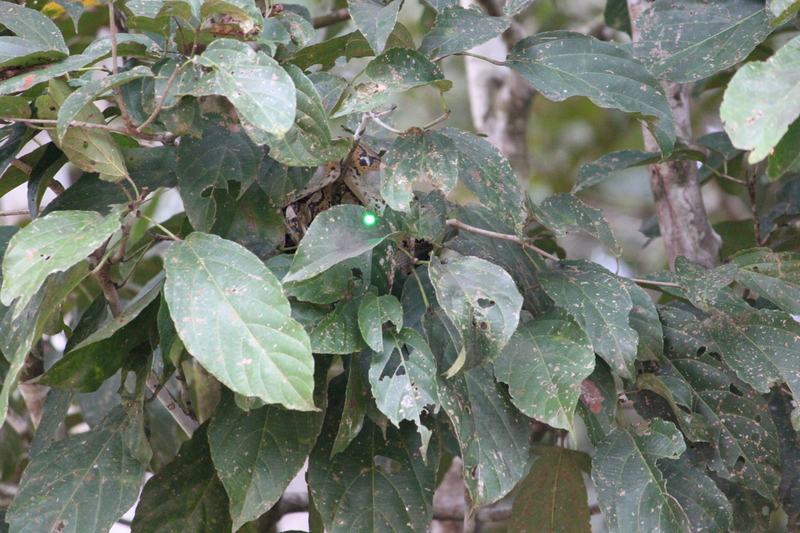 And then I had to hunt for the green dot…..I see some of your other readers were the same. It would be interesting to use for a perception class – psychology or biology – and see what percentage see the snake no problem and what percent don’t. It would be a fun test and it blows my whole theory that 99% wouldn’t be able to see it. I wonder what the correlation would be: would those who hate snakes see it more since they have a fear? Or those who love snakes? I like snakes, though I give them healthy respect. i like snakes, but i would never have spotted this one without the marker. in fact, i had trouble spotting it _with_ the marker. No worries, so did I. I still have to squint to see it. I wouldn’t have seen it if you hadn’t pointed it out. I think I would have been glad to have imagined the guide was making it up! It did make me feel better. I ‘think’ I can just about spot the snake unless it is a small branch which I think is the snake. Boa Constrictor?!! The name it self sounds sinister. I need to remember that saying, it’s wonderful! I really enjoy all the tidbits that you share. And Pythons and Cobras–just the words make me start to shake! I guess it’s his job to know what to look out for and whereabouts to find them? I have seen that one. that’s perfect! I used to love Friends. When I moved here I was surprised that Friends is on all the time here. I’m finding that more are able to see the snake without any help. Maybe me fear is too powerful. I have to admit, I thought the Snakes in a plane movie was kinda funny. I have to stare at the picture to finally make out the snake.. I did as well. At first I was why did I take this picture, it’s just leaves. Every trip proves this to me. I saw it without seeing the Green dot…And after I realized….I have to say I HATE snakes…When we were in Botswana our guide told us about a Black Mamba….I am glad I was unable to see it…If not I would still be running!!! I agree with you in one thing; guides are incredible…They are able to see anything, any track….Incredible indeed!!! When we were in Botswana it was winter so there wasn’t a decent chance that we would have seen a Black Mamba. Good thing. The better half would have flown home immediately. And yes, the guides are amazing. I wish I had their skill and knowledge. We loved Malaysia. We have two friends who live there and that’s how we decided to bump the country up the list. It was all fantastic–even the hidden creatures.